While most Americans agree that the country needs to do more to achieve racial equality, some tactics for achieving this goal are seen as more effective than others. 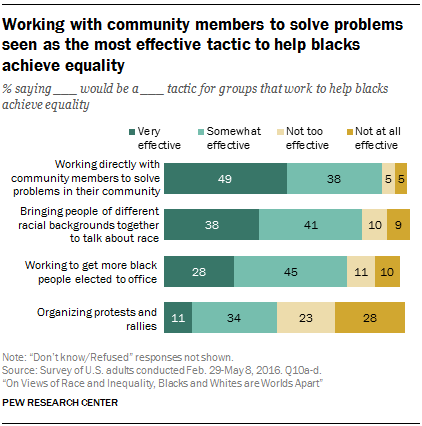 For example, about half of Americans say it would be very effective for groups working to help blacks achieve equality to work directly with community members to solve problems in their communities (49%), while fewer say bringing people of different racial backgrounds together to talk about race (38%), working to get more black people elected to office (28%), or organizing protest and rallies (11%) would be very effective. Blacks are generally more likely than whites to say most of these tactics would be effective for groups working to promote racial equality, but at least seven-in-ten among each group say working directly with community members, bringing people of different backgrounds together for dialogue, and working to get more black people elected to office would be at least somewhat effective. Blacks and whites differ most widely in their views of protests and rallies: 63% of black Americans say organizing these types of events would be at least somewhat effective, compared with 39% of whites. The survey also finds that about two-thirds of black Americans support the Black Lives Matter movement, including 41% who strongly support it. Far fewer (40%) whites express at least some support for the Black Lives Matter movement, and only 14% say they strongly support it. Among Hispanics, about a third say they strongly (15%) or somewhat (18%) support the Black Lives Matter movement. 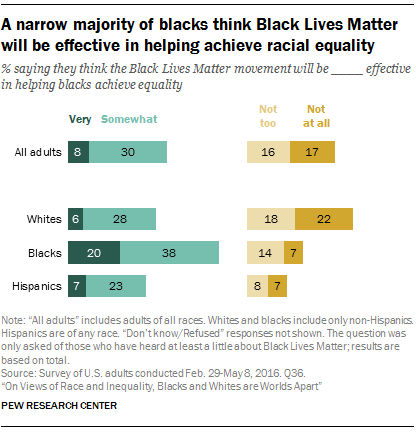 When asked about the Black Lives Matter movement’s effectiveness in helping blacks achieve equality, roughly six-in-ten (59%) blacks say it will be at least somewhat effective in the long run. Smaller shares of whites (34%) and Hispanics (31%) say the movement will be effective. A majority of black adults also say that that the NAACP (77%), National Urban League (66%) and the Congressional Black Caucus (63%) have been at least somewhat effective in helping blacks achieve equality. Groups whose goals include helping blacks achieve equality in the U.S. may use a variety of tactics to reach this aim. The survey tested four approaches to bringing about change: working with community members, bringing people of different racial backgrounds together to talk about race, working to elect more black people to office, and organizing protest and rallies. Of these tactics, working directly with community members to solve problems in the community is seen as particularly effective. Roughly half of whites (46%), blacks (48%) and Hispanics (53%) say this would be very effective for organizations working toward racial equality. When it comes to bringing people of different racial backgrounds together to talk about race, at least four-in-ten blacks (41%) and Hispanics (45%) see this as a very effective tactic for groups that work to help blacks achieve equality, compared with about one-third of whites (34%). Blacks and Hispanics are also more likely than whites to say working to elect more black people to office would be a very effective tactic (38% and 36% vs. 24%, respectively). Across racial and ethnic groups, fewer say protests would be very effective than say this about the other tactics tested. 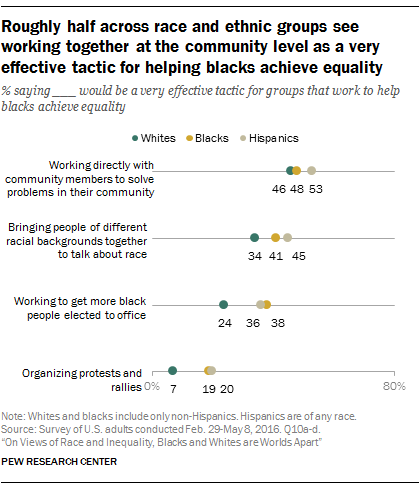 Still, blacks (19%) and Hispanics (20%) are nearly three times as likely as whites (7%) to say that organizing protests and rallies would be a very effective tactic for helping blacks achieves equality. And when those who say this tactic would be at least somewhat effective are considered, the opinions of blacks and whites are nearly mirror opposites of each other. About six-in-ten (63%) black adults say organizing protests would be at least somewhat effective; 58% of whites say this tactic would not be particularly effective, including 33% who say it wouldn’t be effective at all. White adults younger than 30 are more likely than older whites to see protests as at least a somewhat effective tool for groups working to achieve racial equality. About half (52%) of younger whites say this, compared with 36% of whites ages 30 to 49, 42% of those ages 50 to 64, and 30% of those ages 65 and older. Blacks across demographic groups share similar views about the effectiveness of protests and the other tactics asked about in the survey. A majority of blacks say that the NAACP, the National Urban League and the Congressional Black Caucus have been at least somewhat effective in helping blacks achieve equality in this country. However – and perhaps not surprising considering the large share of blacks who say the country has work to do for blacks to achieve equal rights with whites – only about three-in-ten or fewer say each organization has been very effective. 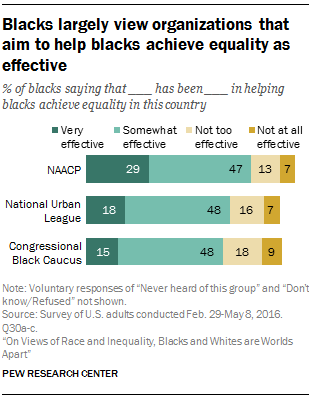 About three-quarters of black Americans say the NAACP has been very (29%) or somewhat (47%) effective in helping blacks achieve equality, while about two-thirds say the same about the National Urban League (18% very effective and 48% somewhat effective). Most blacks (63%) also say the Congressional Black Caucus has been at least somewhat effective, including 15% who say it has been very effective. Blacks across demographic groups largely share the same views on the effectiveness of these organizations. Yet, awareness of these groups isn’t necessarily uniform. While virtually all blacks have heard of the NAACP, 7% say they have not heard of the National Urban League and 6% say they haven’t heard of the Congressional Black Caucus. Young black adults ages 18 to 29 are considerably more likely than older blacks to volunteer that they have never heard of the National Urban League or the Congressional Black Caucus. About one-in-five (18%) young black adults say they have never heard of the National Urban League, compared with 7% of those ages 30 to 49 and 2% of adults in older age groups. And 12% of blacks younger than 30 say they have never heard of the Congressional Black Caucus, compared with 5% of those ages 30 to 49, 2% of those ages 50 to 64, and 3% of blacks ages 65 or older. Roughly three-quarters (73%) of the nation has heard at least a little about the Black Lives Matter movement, including roughly half of Americans (46%) who say they have heard a lot about it. But familiarity with the movement varies greatly across different segments of the population, with awareness particularly high among younger blacks. Blacks are somewhat more likely than whites, and considerably more likely than Hispanics, to say they have heard a lot about Black Lives Matter. Some 56% of blacks say this, compared with 48% of whites and 29% of Hispanics. Fully half of Hispanics say they haven’t heard anything at all about the Black Lives Matter movement. Among blacks, those ages 18 to 29 are more likely than older adults to say they have heard a lot about the Black Lives Matter movement. Roughly three-quarters (74%) of young black adults say this, compared with 62% of those ages 30 to 49, 43% of those ages 50 to 64 and 38% of blacks 65 or older. Among whites, however, similar shares of those younger than 30 (51%), those ages 30 to 49 (51%) and those ages 50 to 64 (50%) say they have heard a lot about the Black Lives Matter movement. Fewer whites ages 65 or older (39%) say this. Among blacks and whites, those with higher levels of education are more likely to say they have heard a lot about the Black Lives Matter movement. Among blacks, 71% of those with a bachelor’s degree or more and 63% of those with some college education say this, compared with 45% of black adults with a high school diploma or less. Among whites, 59% of those with a college degree say they have heard a lot about the movement, while 47% of those with some college education and 37% of those with a high school diploma or less say the same. In addition to reporting that they have heard a lot about the Black Lives Matter movement, most blacks (62%) say they understand the group’s goals at least fairly well, including a third who say they understand its goals very well. 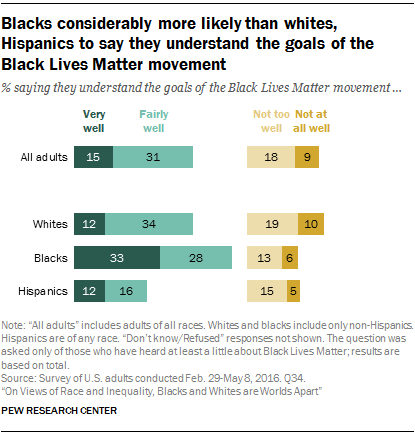 Roughly half (46%) of whites and 28% of Hispanics say they understand the goals of the Black Lives Matter movement at least fairly well, including just 12% in each group who say they understand the goals very well. 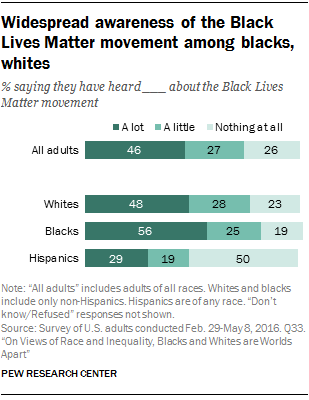 Looking at those who have heard at least a little about the Black Lives Matter movement, larger shares among all racial and ethnic groups say they understand its goals. Fully 76% of blacks who have heard of Black Lives Matter say they understand the goals of the group, including 42% who say they understand them very well. Roughly six-in-ten whites (61%) and Hispanics (59%) who have heard at least a little about Black Lives Matter say they understand its goals at least fairly well. Some 43% of U.S. adults say they strongly (18%) or somewhat (25%) support the Black Lives Matter movement. About two-thirds (65%) of blacks say they at least somewhat support the movement, including 41% who offer strong support. By comparison, 40% of whites and 32% of Hispanics express support for the Black Lives Matter movement (14% of whites and 15% of Hispanics say they strongly support it). White adults younger than 30 are far more likely than older whites to say they at least somewhat support the Black Lives Matter movement. Six-in-ten young white adults say this, compared with 46% of whites ages 30 to 49, 37% of those ages 50 to 64, and 26% of white adults ages 65 or older. 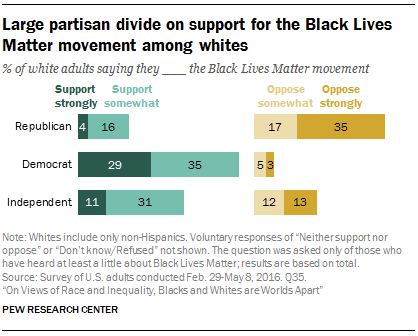 White Democrats are also far more likely than white Republicans and independents to express support for the Black Lives Matter movement. Some 64% of white Democrats say they at least somewhat support it, similar to the share of black Democrats (65%) who say the same. By comparison, 20% of white Republicans and 42% of white independents say they support the Black Lives Matter movement at least somewhat. 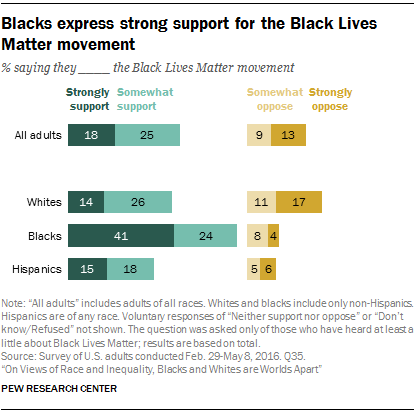 Among blacks, support for the Black Lives Matter movement is particularly widespread among those younger than 50; and those in this group are also more likely to express strong support. About half of blacks ages 18 to 29 (52%) and ages 30 to 49 (47%) say they strongly support the Black Lives Matter movement. By comparison, a third of blacks ages 50 to 64 (32%) and 26% of those ages 65 and older say the same. While older blacks are less likely to have heard about the movement, this age gap remains when looking only at those who say have heard at least a little about it. Roughly four-in-ten (38%) Americans say they think that, in the long run, the Black Lives Matter movement will be at least somewhat effective in helping blacks achieve equality, including 8% who say it will be very effective. A third of Americans say the movement will not be too effective or won’t be effective at all. Most blacks (59%) believe the Black Lives Matter movement will be at least somewhat effective in helping blacks achieve equality. This includes one-in-five blacks who think the movement will be very effective. By comparison, 34% of whites and 31% of Hispanics say the Black Lives Matter will be at least somewhat effective; just 6% and 7%, respectively, expect it to be very effective. As with other questions related to Black Lives Matter, whites’ assessments of how effective the movement will be in the long run are split along party lines. White Democrats are considerably more likely than their Republican and independent counterparts to say Black Lives Matter will be at least somewhat effective in helping blacks achieve equality (53% vs. 20% and 34%, respectively).